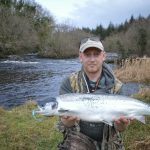 The 2018 salmon season on the river Drowes has been under way since Monday 1st January and at time of writing we are waiting for the first salmon of the new season to be landed. One salmon was reported lost on flying c from the Black Gutter on opening day. Since then we have had persistent heavy rain and the river is now in full flood, making for difficult fishing conditions. The weather outlook is for colder, drier conditions over coming days which should see a drop in water levels and an improvement in fishing prospects.